114. Definition. The root is the basis of the plant and the principal organ of nutrition. It originates with the radicle of the seed; the tendency of its growth is downward, and it is generally immersed in the soil. 115. Diagnosis. 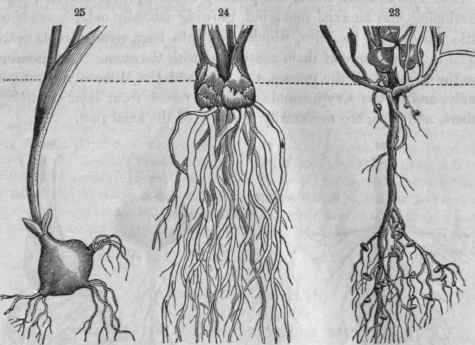 Roots are distinguished from stems by their downward direction, by the presence of absorbing fibers, (fibrillae), and by the absence of color, pith, buds, leaves, and all other stem-appendages. 116. Office. The two important offices in vegetable life which the root is designed to fulfill, arc obvious to every one, viz., to support the plant in its position, and to imbibe from the soil the food and moisture requisite for its growth. How well God has adapted its structure and instincts to this twofold purpose observation is continually showing. 22, a. Extremity of ft rootlet of maple with its fibrillae and spongiole (magnified 50 diameters.) insures a firm hold upon the earth, and brings a large absorbing surface in contact with the moist soil. 23. White clover - an axial root (with minute tubers). 24, Buttercups - fibrous roots, inaxial. 25, Erigenia - root tuberous. 118. The summit of the root, or that place where the root meets the stem, is called the collum; the remote, opposite extremities, the ends of the fibers, being chiefly active in absorption, are the spongioles. Neither of these terms denote distinct organs, but places only, and are often convenient. 119. Fibrillae, a Latin term, refers to those minute hairs, (seen only with a lens), which clothe the younger fibers. They arise from the tender epidermis or skin, and perish when that thickens into bark. These cooperate with the fibers in the absorption of fluids. These two organs are the only efficient absorbers of liquid nourishment. 120. Transplanting trees. The fibrillae are developed and perish annually with the leaves, whose servants they are. Few of them remain after the fall of the leaf. This fact plainly indicates that the proper time for transplanting trees or shrubs is the late autumn, winter, or early spring, when there are but few tender fibrillae to be injured. 121. Two modes of root-development are definitely distinguished, - the axial and the inaxial. 122. The axial mode is that where the primary, simple radicle, in growing extends itself downwards in a main body more or less branched, continuous with the stem, and forms the permanent root of the plant. 123. The inaxial mode, the primary radicle, proves abortive, never developing into an axial root: but, growing laterally only, it sends out little shoots from its sides, which grow into long, slender roots nearly equal in value, none of them continuous with the stem. Of this nature are the roots of all the grasses, the lilies and the Monocotyledons generally, and of the Cryptogamia. 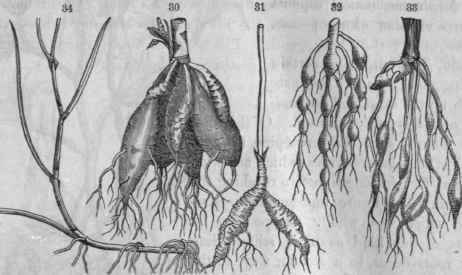 Plants raised from layers, cuttings, tubers, and slips, are necessarily destitute of the axial root. Figs. 26, Maple - an axial, ramose root. 27, Parsnip - a fusiform root. 2S, Turnip - a napiform root. 29, Corallorhiza - a coralline root. 124. The various forms of the root are naturally and conveniently referred to these two modes of development. The principal axial forms are the ramose, fusiform, napiform, conical. To all these forms the general name, tap-root, is applied. 125. The ramose is the woody tap-root of most trees and shrubs, where the main root branches extensively, and is finally dissolved and lost in multiplied ramifications. 127. The fusiform (spindle-shaped) root, thick, succulent, tapering downwards, and also for a short space upwards. The beet, radish, ginseng are examples. 128. The conical root tapers its whole length, from the collum downwards (carrot). 129. 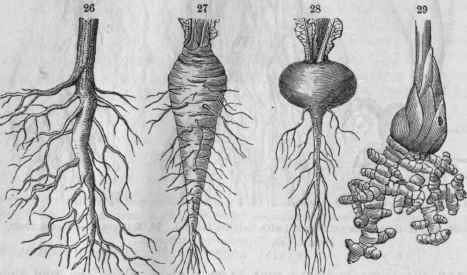 The napiform root, (turnip,) swells out in its upper part so that its diameter equals or exceeds its length, as in Erigenia bulbosa (25), Turnips (28). Figs. 30, Paeony - fibro-tuberous roots. 31, Ginseng - fusiform root. 32, Pelargonium triste - moniliform root. 33, Spirea fllipendula - nodulose root 34, A creeping stem, with adventitious roots. 130. The forms of inaxial roots are fibrous, fibro-tuberous, tubercular, coraline, nodulous, moniliform. 131. 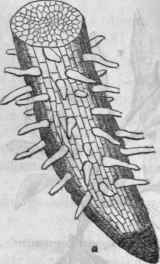 The fibrous root consists of numerous thread-like divisions sent off directly from the base of the stem, with no main or tap-root. Such are the roots of most grasses, which multiply their fibres excessively in light sandy soils.